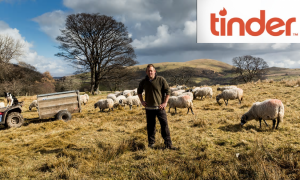 A Highland crofter was left confused and terrified this week after a friend signed him up to the popular dating app Tinder thinking it was a supplier of kindling. “I considered packing in the old crofting to take up the shagging full time but I have found that it is starting to get in the way of Emmerdale and tractor maintenance. So far my wife has kept her opinions to herself … either that or she’s left me”. This comes only a month after a free church minister in Assynt signed up for the gay dating app Grindr thinking it sold parts for flour mills.